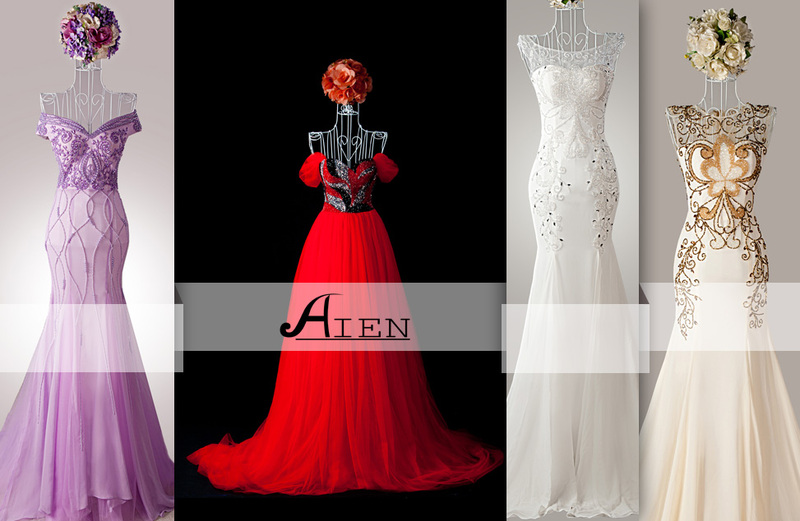 “AIEN” means LOVE & DESTINY. It is a phonetic transcription of Japanese words. Destiny has brought Sano – a Japanese engineer to meet and get married to a Vietnamese woman working as a fashion designer – Hoai Thuong, and made him stay here in this S-shaped unique land. Through years of studying and working in several countries and continents as well as experiencing all the ups and downs in life, we believe that any one of us is led by our own DESTINY and grow our own LOVE. And the LOVE & DESTINY of us both are FASHION. AIEN was introduced at the beginning of 2015, marking our long road being together in our life and our creative journey to make beauty products for people. Mission: To honor the beauty of women, regardless of their skin color and race. Style: Making an elegant and charming difference on the basis of respecting the personalities and diversified cultures of wearers. sequin kate, matte satin, chiffon, fashionable mesh fabric, crystal pieces for decoration. Design: Being simple and making breakthrough to create the feelings of elegance and attraction yet comfort and safety for wearers. experienced and understanding when working with customers to sketch up the most suitable designs. Sample-sewing experts are experienced, familiar with different materials. They understand thoroughly the designs and procedures to make the products complete. and highlight specific designed patterns on products. the perfect beauty and consistence of the products compared to the designs at the first place. Wedding Dresses: Honor the body beauty and create the magnificence and elegance for the bride in her most special day. Party Dresses: Help wearers stand out from the crowd thanks to the glamorous designs and unique patterns. Beads Dresses: Enhance the uniqueness, elegance, and nobility of wearers by the designs with skillfully hand-made crystal beads.